Mind the entrance. Your front door is literally the beginning point in the journey of your home. It is where you welcome people, and where air circulates most freely. Place or hang plants near the front entrance whenever possible. Disguise harsh lines. Slopes ceilings, corners, and other sharp lines are considered negative energy enhancers because they stop the flow of chi through a house. use plants to disguise these architectural features of your house and enhance air flow between rooms and through "dead" spaces. Don't keep dead or dying plants. It seems obvious, but dead or dying plants emit negative energy and should be discarded. This applies to cut flowers also. In general, flowers are good for the home, but declining bouquets should be discarded. After all, what's the point in keeping a literal symbol of death hanging around? Keep herbs in the home. The Chinese often burn herbs after an argument or other disruptive event to purify the home. Growing herbs are also beneficial and should be kept in the home. Lavender is a particularly powerful herb as it is widely considered to promote relaxation and peace. Think in terms of whole rooms. Decorate the whole room at once with plants, or begin on one side and move slowly across the room. 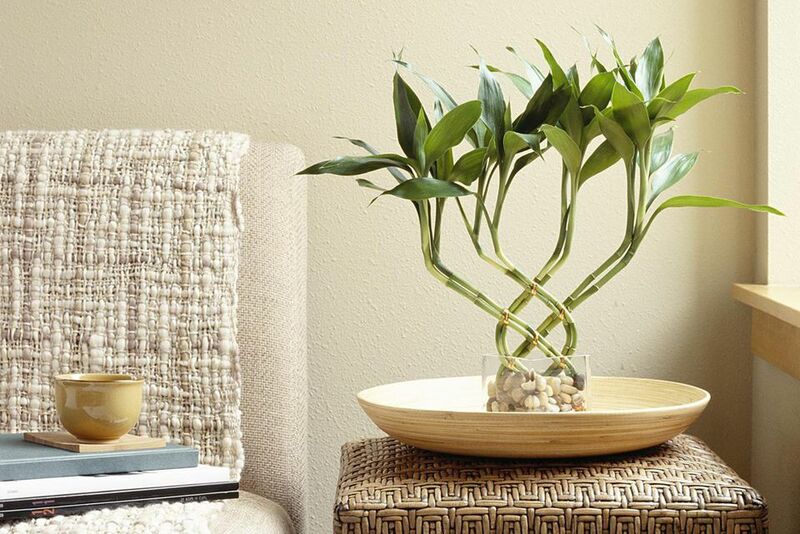 Don't think of the plants as separate from your furniture, but as an integral part of your living space. Pairs are considered beneficial also, so use pairings of plants to increase chi. Avoid thorns. Thorny plants form a protective barrier, thus stopping the flow of chi. If you must, place them by a window to discourage intruders. Don't place thorny plants near the front door. Bamboo. Any variety of bamboo is a good, even lucky bamboo (which technically is Dracaena sanderiana, a shrubby plant native to west Africa). Dracaena. There are many species of dracaena, some of which form thick, wooded stalks. Jade plants. These are sometimes called money plants. Ficus species. There are many species of ficus, including rubber plants and the weeping fig. These are beneficial plants—in fact, Buddha achieved enlightenment while sitting beneath a ficus tree. Hanging plants. Baskets are great for moving chi throughout a room and near the ceiling. In the truest sense of the word, feng shui is not merely concerned with interior decoration or plant placement, but with the flow of energy in the world at large and all of its occupants. Obviously, one person can't right imbalances throughout the world, but according to principles of feng shui, we can each begin in our own little spaces and, ideally, harmony will emanate from a thousand points to cover the globe.